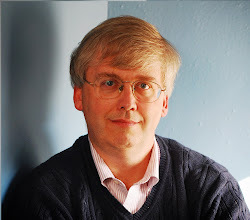 CONVERSABLE ECONOMIST: What is Killing US Coal? "Environmental regulations — the primary suspect for some — killed coal. 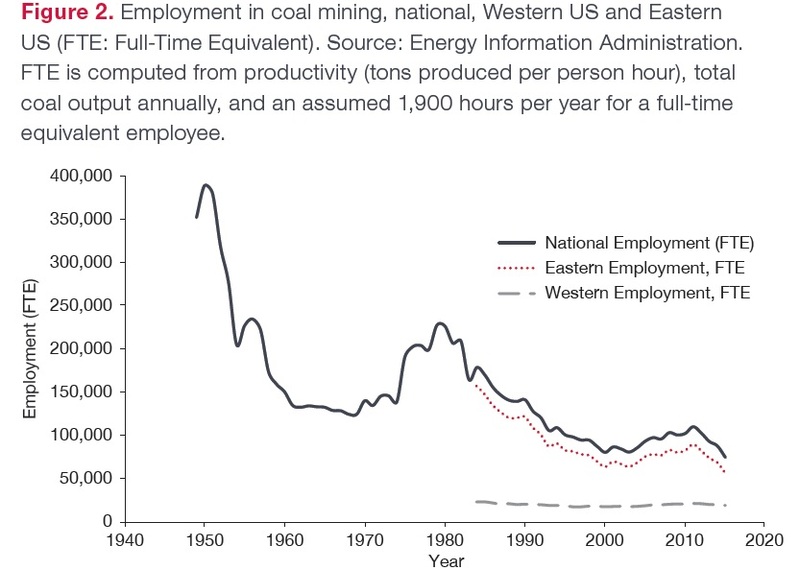 "Deregulating railroads in the 1970s allowed cheap Western coal to displace more costly Eastern coal, resulting in major job losses in the labor-intensive Eastern coal industry. "The fracking revolution has driven down natural gas prices, making coal less competitive in electricity production. "Coal mining jobs are going away because of the same productivity gains that have led to fewer manufacturing jobs across the country — workers can produce more coal per hour, meaning fewer workers are needed to maintain steady coal output. "Other reasons include financial markets, which may see the future of coal as risky (for a variety of reasons) and thus a poor investment." The list of suspects has obvious political implications. For example, if the drop in coal is about high productivity growth among coal miners, or the rise of natural gas production, then there's not much the government can (or should) be doing to alter the situation. If the drop in coal is mainly about environmental rules, then we could perhaps have an argument over the costs and benefits of such rules, or whether such rules might be redesigned in a way that reduces a substantial share of the costs but keeps a substantial share of the benefits. Kolstead's conclusion: "[E]nvironmental regulations did not kill coal. Progress is the culprit." Here's some additional detail, starting with the big-picture overview of US coal output and jobs. Total US coal output rose fairly steadily from 1950 up to about 2010. 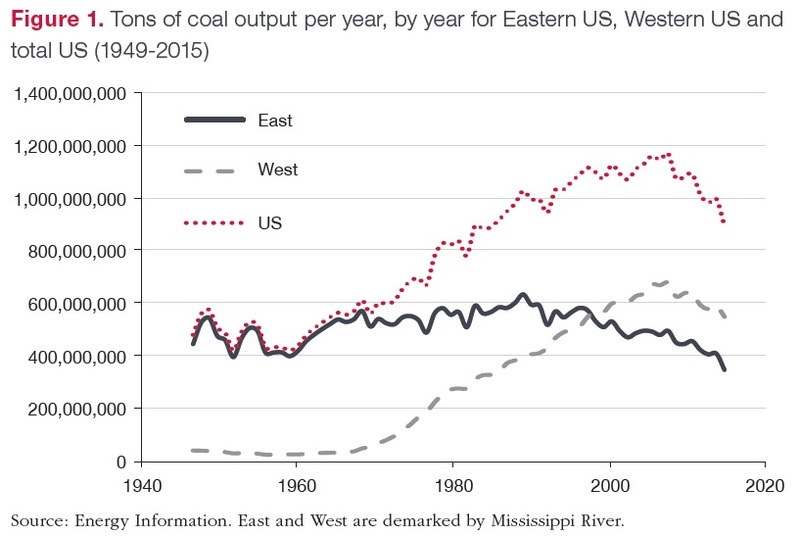 However, the graph shows that all of the rise was in western coal, like the Powder River Basin in Montana and Wyoming, rather than eastern coal like West Virginia and Pennsylvania. Railroad deregulation in the 1970s made it much more cost-effective for western coal to be shipped around the country. Employment in the coal industry first fell sharply in the 1950s with the agreement between the United Mineworkers union to pursue automation in the coal industry in exchange for better wages. There is another long decline in coal miner jobs starting around 1980, but it is mostly in eastern mines. 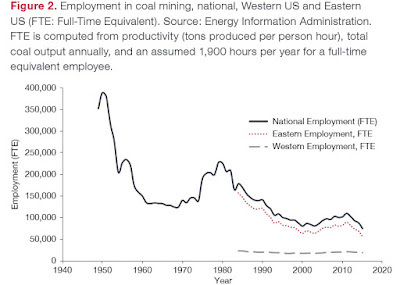 Remember, the output of eastern mines wasn't changing much during most of this time, which implies that the productivity of coal miners was rising substantially. More recently, the rise of natural gas production has taken market share from coal: for example, coal has traditionally been the main fuel for generating electricity, even into the early 2000s. However, the share of electricity generated by natural gas now exceeds that from coal. What about environmental regulations as a reason for decline in the coal industry? Kolsted points out two ironies here. "The easiest way to meet the 1970 sulfur emissions regulations was to burn low-sulfur coal, which set off a dramatic expansion of low-sulfur coal mining, primarily in Wyoming. The strong demand for low-sulfur coal threatened high-sulfur coal producers, primarily in the East. "In order to save coal-mining jobs in the East, the Clean Air Act was amended in 1977 to require equipment on all new coal-fired power plants to physically remove sulfur from the smokestacks after combustion, reducing the attractiveness of low-sulfur coal (all coal becoming “compliance coal”). This reduced the competitive threat to Eastern mines. "Another feature of the 1970 Clean Air Act had more subtle and delayed effects. That is the exemption of existing (as of 1970) power plants from sulfur reduction rules. This “grandfathering” was done for political reasons to facilitate passage of the Act. But it was also viewed as fair and without long-term consequences since those older plants were expected to retire at the end of their 40- or 50-year lives anyway. But as Revesz and Lienke (2016) detail, this exemption provided an incentive to keep old and dirty power plants operating rather than retire, despite the higher operating costs of old plants. To protect health and welfare, this necessitated the EPA’s imposition of more restrictions on old power plants over the years, including the acid rain provisions instituted in 1990 during the Bush administration. Additional rules were put in place during the next three presidential administrations to deal with the problems caused by old plants operating long after their assumed retirement date. "Now, nearly 50 years after the 1970 Act, shuttering of old power plants has finally begun. ... [T]he coal plants retired in 2015 were quite old (the oldest began operation in 1944, the year the Allies landed in Normandy). ... This suggests that the decline in coal-fired electricity generation is largely the result of an aging fleet of power plants, which may well have been retired years ago absent the Clean Air Act’s grandfathering clause." Second, if environmental regulations are loosened for all types of energy production--that is, for natural gas as well as for coal--it's quite plausible that natural gas will continue to gain relative to coal. 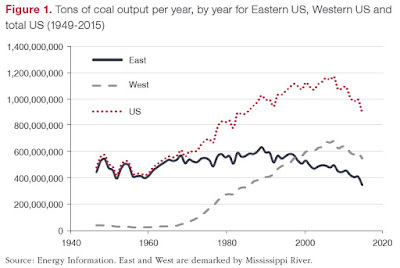 So yes, environmental rules affected eastern coal production. But the big stories for the fall of coal are productivity growth among coal miners and the rise of natural gas. demand for eastern coal might well be larger today if instead of favoring aging coal-fired electrical power plants through grandfathering rules, those plants had been updated and replaced over the decades.